A virtual Linux machine used for development was behaving unreliably. Programs would fail to start and running program would freeze. I decided to restart the system, however it failed to start up again. 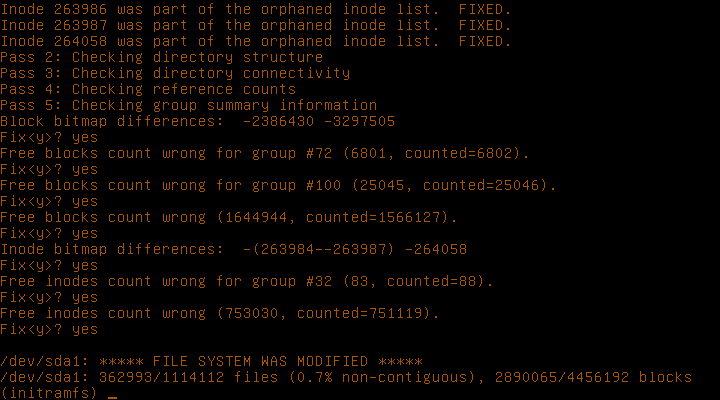 File system corruption seemed to explain the reliability problems and the subsequent boot failure. Accepted all file system repairs suggested by fsck. After the file system repairs the system booted and seemed fully functional. If a Linux system fails to boot and only displays a BusyBox / initramfs prompt, try exiting the shell. This may provide information about the actual problem. A Raspberry Pi 3 had a problem after I had performed a number of system changes. This didn’t work because of authentication problems and (as a side effect) it delayed startup significantly. The script relies on the mount.cifs command. For Debian based Linux distributions this is part of the cifs-utils package. After 10 minutes of inactivity I decided to reset the system. As expected this caused problems. Various ways to reinstall and remove the ntp package were unsuccessful. If a package is broken on a Debian based Linux system it can be a solution to remove it forcefully with the –force-remove-reinstreq option for dpkg.